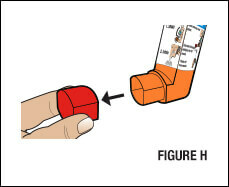 Wash your inhaler after each day of use. 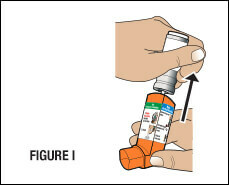 Run water through the mouthpiece for 30 seconds after each day of use, as instructed below. Remove red cap (Figure H). Remove container by firmly grasping and pulling out the container, then set aside (Figure I). Don’t be afraid to pull hard on the container. Run water through both ends of the mouthpiece for 30 seconds (Figure J). Shake off as much water as you can. Put your inhaler back together before next use. Important: If you need to use when wet, shake off excess water before dosing.